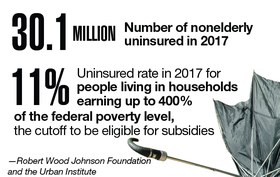 Data Points: As open enrollment approaches, who is uninsured? Between 2010 and 2017, more than 19 million people moved from the ranks of the uninsured to insured. And from 2015 through 2017, when key elements of the Affordable Care Act were being debated in policy circles, the ranks of the uninsured fell by 2.9 million. With the 2019 open-enrollment season just a few months away, here's a look at some key demographic data.